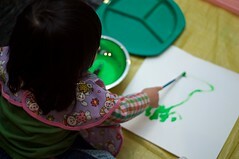 Today Phoebe helped paint a tapestry for Kids Earth Fund. 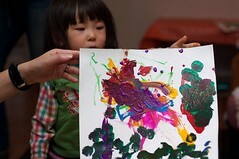 Their mission is to promote “Children helping children” through donations received from paintings and artwork. The first stop for this tapestry will be the Beijing Olympics, then onto New York for display at Citi headquarters in September. We are strong believers and supporters of KEF. Our offices are filled with beautiful art painted by children all over the world. Please check out the photos, and the KEF website!